A NEW KIND OF MESSAGE THAT CELEBRATES WOMEN AND THE VINE. ﻿﻿﻿I am a story teller. Vineyards and wine; they're the perfect muse. Because of their mystery and primal essence, they make it easy to be a poet. At least for me. For many years now I have been a true follower of wine. I have visited many wine regions--having lived in Washington and California--and enjoy the social, aesthetic and historic experience involved in each winery I visit. I have even named my second home in the mountains, "The Grape Escape." Clearly it's an obsession. However, I have found an interesting void in the vineyard vacation. And that is the lack of wine gifts that uplift and celebrate the spirit. In my case, the spirit of women and wine. The whole wine making process is such a metaphor for our journey as people, bu the essence of the experience seems particularly suited to the feminine attributes, and yet the only wine "gifts" so to speak are whimsical and rarely serious. Don't get me wrong, I've had a good therapuetic laugh with girlfriends while we've sipped away. But given that wine has such a philosophical presence I decided that it was time market my own brand of vini-wisdom. And I'm calling it, BeIntert.wine.d™. My goal? To create a verbal wellspring of wisdom about women and the the grape. Our first series of gifts is a set of 8 messages of hope and reflection, inspired by and including the art of Cynthia Howard. 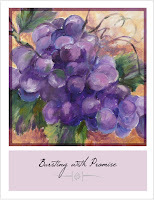 The brush and the pen combine to create greetings that celebrate the enlightened state, clearly inspired by the vine. To view each card in the series and order, click here. Our next goal is to have them available at all tasting rooms in North Carolina with a dream of offering Intertwined everywhere you see, talk about, taste or muse about wine, all over the country and beyond! If you love wine, and you want to share a message with a friends, we hope you will say it with the vine in mind!